"Fair play to Munster... I'm proud of our boys too. Not one of them gave up." 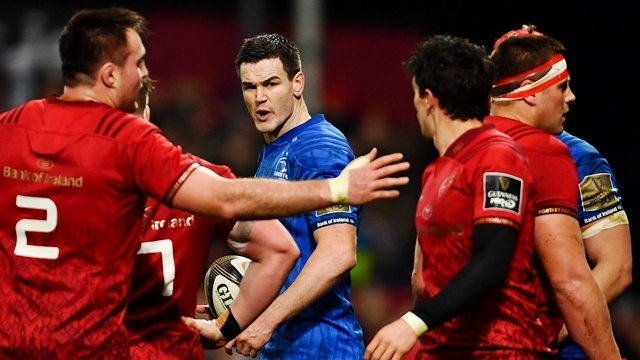 Johnny Sexton had regained his composure by full-time, at Thomond Park, and spoke gracefully about the Munster team that had handed Leinster only their third defeat of the season. Johann van Graan's men tore into the Guinness PRO14 champions from the get-go and were full value for their 26-17 victory. Leinster did well to stay in the contest with 14 men (13 when Tadhg Furlong was in the sin-bin) until a late Keith Earls intercept try sealed a home win. Following the game, Sexton admitted that the two yellow cards, James Lowe's sending off and the concession of other penalties cost his side. "It doesn't take a scientist to work out that it was discipline that probably cost us the game," he told eir Sport. "It's a tough enough game with 15 men, let alone 13 and 14. But look, all the things that happened (for yellow and red cards) were probably accidents and nothing intentional, but it is something we'll have to learn from." The post-match press briefing found Sexton in stoic form. 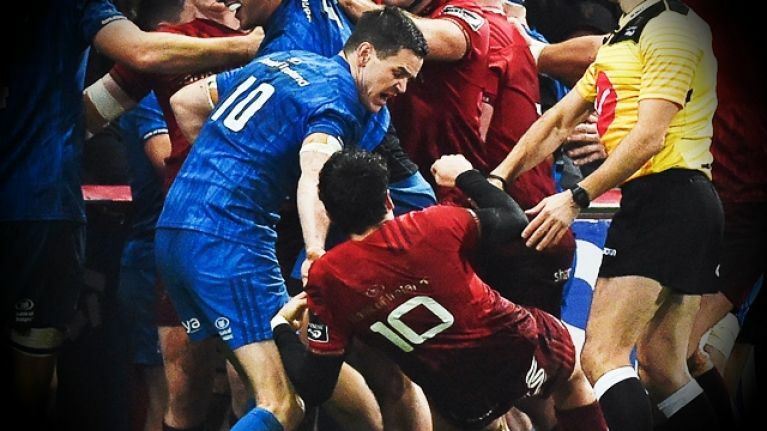 He had no quibbles with the cards issued by referee Frank Murphy and only questioned why he was penalised for retaliation - on Fineen Wycherley - when Munster avoided sanction for a similar incident. We did get to ask Sexton about his two notable coming(s) together with former Leinster teammate Joey Carbery. Here is how that conversation with Sexton went. SPORTSJOE: "There were two issues with yourself and Joey Carbery during the game. There was a little bit of afters and you threw him to the ground. Probably no issue there, but there was another one when you were in a ruck and it looked like maybe there was a bit of a knee as you were getting into. Carbery reacted to it. That is getting shared a lot, at the moment. Can you remember that (incident) at all?" SPORTSJOE: "There other one was, as I said, at the sideline where Conor (Murray) and James Lowe got involved - Jean Kleyn as well. You threw Carbery to the ground as well. Is that something that happens in the game as well, nothing to make a big deal of? Can you remember if anything was said at the time? SEXTON: "Yeah, nothing said. No. It's just something that happens in rugby matches. The Leinster captain was switched for Ciaran Frawley after 60 minutes and briefly looked to ask the young outhalf if it was, in fact, him that was being replaced. "No, it was always the plan," Sexton said and Leinster head coach Leo Cullen confirmed that 'we wanted to get Ciaran the exposure to that game and that was why we made the change after 60 minutes'. Sexton did have a bag of ice placed on his right calf after he was taken off but Cullen did not list him as an injury concern in his briefing. Munster openside Chris Cloete, meanwhile, remained at the ground after he was stretchered off and van Graan said he still had a 'stiff neck' after he was forcibly cleared from a ruck by Tadhg Furlong.